I’m going to go ahead and call this the ultimate curry chicken salad wrap. It’s packed with flavor and crunch. 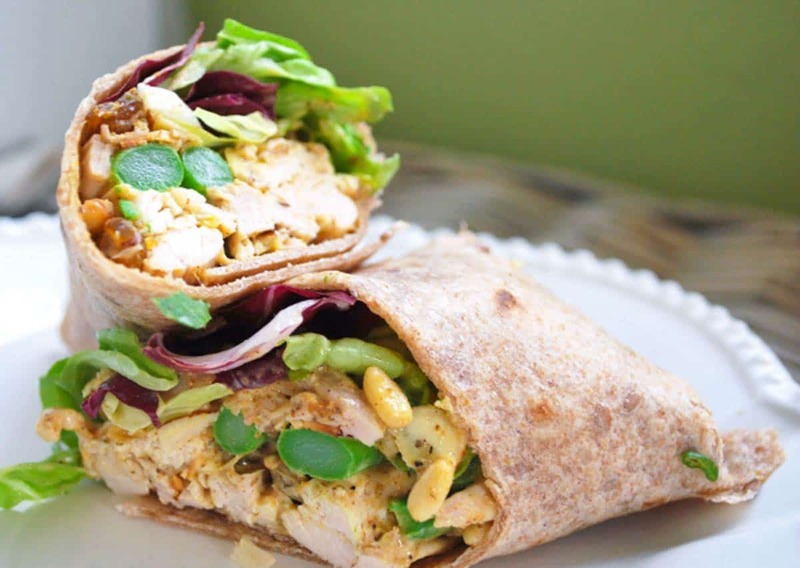 Jump to the Ultimate Curried Chicken Salad Wraps Recipe or read on to see our tips for making it. Our favorite sandwiches and wraps have a variety of textures, flavor and colors. That’s why this chicken wrap wins. The chicken salad is made with leftover roasted chicken, which means it already has lots of flavor thanks to the roasting. Then we add a dressing made from mayonnaise, curry powder and marmalade jam. The jam is a nod to mango chutney often found served with traditional Indian dishes. If you have it on hand, use it instead of the marmalade. You could stop there and the curried chicken would be excellent, but as I said earlier, we love texture and color. To add some chewiness, we add raisins. Then for crunch and color, we throw in chopped scallions, toasted nuts and chopped blanched asparagus. 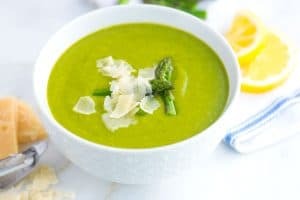 By blanched, I mean that the asparagus is thrown into boiling water until tender, but still crisp then we plunge it into icy water to stop the cooking. You could add raw, but we prefer the texture when blanched. (It only takes a few minutes). 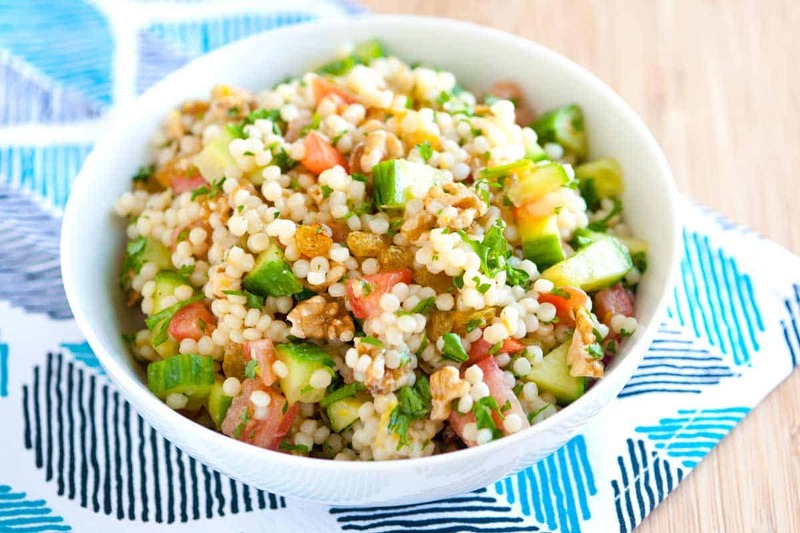 YOU MAY ALSO LIKE: How to make light and healthy couscous salad with a simple lemon vinaigrette, cucumber and herbs. 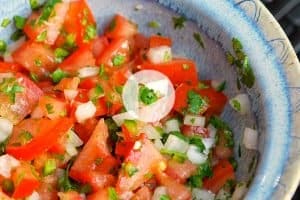 Jump to the Easy Couscous Salad Recipe. The chicken salad is made with leftover roasted chicken, which means it already has lots of flavor thanks to the roasting. You can substitute with store-bought rotisserie chicken or use our shredded chicken recipe — it is our favorite way to make shredded chicken. Stir mayonnaise, curry powder, marmalade, a pinch of salt, and a few grinds of pepper in the bottom of a large mixing bowl. Stir in the chicken. If the mixture seems dry, add a tablespoon of mayonnaise. Taste the chicken and adjust with more curry powder, salt, and/or pepper. Bring a small saucepan of salted water to a boil. Prepare a bowl filled with cold water and ice. Trim about 1/2-inch from the stalky ends and discard. Cut into 1-inch pieces. Add to boiling water and cook until bright green and crisp tender, 1 to 2 minutes. Use a slotted spoon to transfer asparagus to the icy water. Toast the nuts in a dry skillet over medium heat, shaking frequently, until fragrant, browned, and not burned; about 5 minutes. 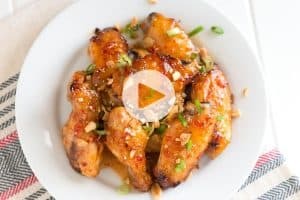 Stir the blanched asparagus, toasted nuts, raisins and scallions into the chicken salad. Divide between wraps, add a few leaves of lettuce and tightly wrap up, tucking in the sides as you roll. Delicious! I’m not the biggest curry fan, but the sweet ingredients nicely balanced the curry. I made it as is, and then again substituting pineapple for the raisins. Both were great, so this is a keeper recipe for me. I also shredded the chicken using my stand mixer which I highly recommend. Thanks for sharing! I’m looking forward to trying more from your site. I used this salad to fill a spinach & herb tortilla rolled into a burrito. However, I could only make 3 rather than 6, and I don’t believe I’m over-stuffing them. 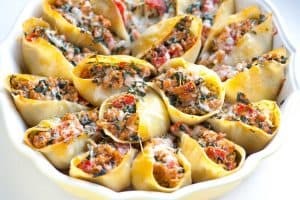 I’m wondering if you are adding anything else besides lettuce, or perhaps you use only about 1/3 cup per wrap. Hey you two, I beat you to it! Just posted MY version of Curried Chicken Salad, which I’ve been making for years. It’s much the same as yours, except that I poach chicken breasts to make it, and then I have the added bonus of the broth for later. And here’s another tip which I think you’ll enjoy. Halve seedless green grapes and add them-maybe instead of the raisins. Tastes wonderful and looks so beautiful! Check out my blog. Ciao. Grapes are a fantastic idea Cindy! We have used them as well in the past, but didn’t have them in stock when we made the last version. Thanks for your comment, your ideas are awesome. This look delicious-I have a chicken roasting in the oven as I type away. Oh Esme, now we are jealous… if only we too had a chicken roasting the oven this very minute too! i am SO making these! they look completely delicious!